Speed and Strength Graphical Overview: New Graphics are Killer! 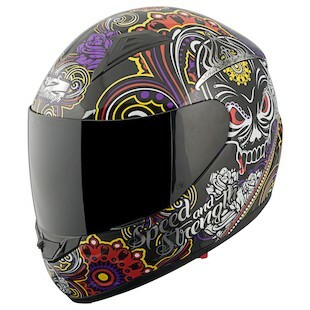 Speed and Strength is known for aggressively priced helmets with aggressive styling. The SS2500 Urge Overkill helmet is true to the brand. 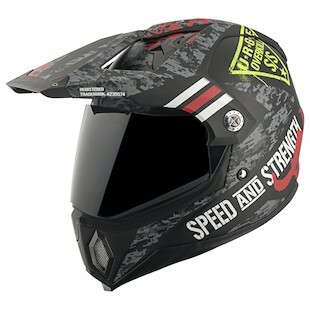 Speed and Strength outfitted their dual sport style lid with a grey and black digital camo graphic that looks at home on the domes of concrete jungle motorcyclists to adventure riders looking to stand out from the pack. Whether you are a street rider looking for a more menacing helmet or an off-roader searching for a more street oriented helmet, the Speed and Strength SS2500 Urge Overkill Helmet will fulfill all that you desire in a hybrid helmet. The next time you get the urge to ride your sportbike on fire roads, pop one these helmets onto your head. The peak will keep the sun out of your eyes, yet cut through the air at higher speeds. It's perfect to satiate that urge for a ride through the local park. Then you can make a quick getaway from the police because they are totally not cool with the tire marks on the grass. Just kidding! Don't do that, but I do urge you to check out the Urge Overkill graphic. Skulls on motorcycle gear. Been there. Done that. Got the matching t-shirt with the matching skull graphic. The Speed and Strength SS1500 Killer Queen Helmet combines pin stripe-esque lines with a Dia De Los Muertos style skull making this brain bucket unique in its combination of classic motorcycle icons. I know what you are thinking. The skull of the prom queen with bloody fangs and a tiara. What's her story? I like to think that she was snubbed by the prom court and flew into a rage, devouring the graduating class. But not before ripping the tiara off of the head from the newly crowned prom queen. The SS1500 Killer Queen graphic is in memoriam to that fateful night. girls with daddy issuesanyone with daddy issues. Keep it simple stupid. That is my mantra. Less is more. If it ain't broke, don't fix it. Yadda yadda. That's why I drink my coffee black. No need to mess with cream or sugar. I eat bologna on white bread for lunch. On occasion, I put a smear of mayo if I am feeling especially decadent that day. I apply that same thinking to helmets. I don't need to make a statement with my helmet. I'm not looking for a mural of The Wreck of the Hesperus on my noggin when I am riding. I just want something in my favorite color, blue. 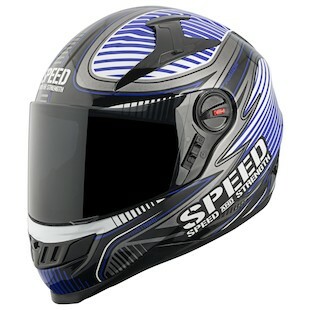 The Speed and Strength SS1300 Speed Strong Helmet is a straightforward graphic that that keeps it simple. The Speed Strong makes a slight departure from other Speed and Strength graphics. It's not a subdued anti-radar dark color matte finish or an intricate aggressive graphic. Instead, the Speed Strong is a bright gloss graphic that your grandmother would love. It bears a slight resemblance to ribbon candy and we all know how old people love that stuff. Choosing the SS1300 is simple since you get a DOT and ECE rated helmet around $150. The Speed Strong adds to that list of available graphics, making the choice not-so-simple. For me, that choice is simple. Blue bikes are always faster, therefore, blue helmet are always cooler.